If tetrapod history had proceeded differently, the major carnivores on land today might have been giant birds. The radiation of mammals in the Palaeocene and Eocene after the extinction of the dinosaurs did not include any very large carnivores (see pp. 329-35), and birds seem to have become top predators in some parts of the world. The gastornithiforms such as Diatryma (see Figure 9.12(b)) may have fulfilled this role in the Palaeocene and Eocene of North America and Europe, although their diet is controversial (see p. 278). There are no such doubts about the phorusrhacids (Marshall, 1978), possible relatives of the cranes and shorebirds. Phororhacos, a typical phorusrhacid, is 1.5 m tall (illustration (a)) and its high-beaked skull shows bone-crushing adaptations. The phorusrhacids are known from the Eocene of Europe and they became well established in South America, where eight genera lived from the Eocene to Miocene, some reaching heights of 3 m or so. 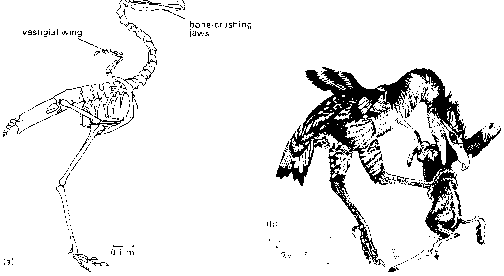 Andalgalornis has been pictured (illustration (b)) attacking a horse-like mammal of the Pliocene by seizing it with a huge clawed foot and tearing the flesh with its powerful beak. 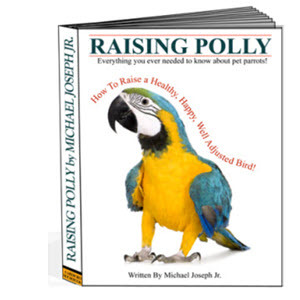 The short wings and tail feathers would have helped it to balance. These terror birds lived on in South America much longer than elsewhere, possibly feeding on larger prey than did the carnivorous mammals of the day. Some also entered North America in the Pliocene and Pleistocene. They were eventually replaced by predatory cats and dogs. 2001). The clade divides into four subgroups. First are the Gruiformes (cranes) and Ralliformes (rails). Cranes and rails date back to the Eocene. Most have long legs and they seek food by wading in shallow water. It is unclear whether all belong to one order or not: when Ralliformes are separated, the Gruiformes probably become paraphyletic. Next come the Pelecaniformes (pelicans, frigate birds, gannets and cormorants), all large fish-eating birds, with fossil representatives known from the Eocene and Oligocene ofEurope. They have extensively webbed feet for swimming and flexible throat pouches that allow them to hold large fishes. An unusual extinct pelecaniform family, the Plotopteridae, from the Eocene to Miocene of the Pacific Ocean (western North America and Japan), were giant flightless birds that mimicked penguins (Olson and Hasegawa, 1979). The wing (Figure 9.12(c)) is reduced to a curved paddle used for rapid flight underwater, and it has converged strikingly on the swimming wing of auks and penguins. Plotopterids ranged from the size of a cormorant to lengths in excess of2m (Figure 9.12(d)). Close relatives of the pelicans may be the Ciconiiformes, the storks and herons. Storks date back perhaps to the Eocene of China, or at least the Oligocene of Egypt. In some analyses (e.g. 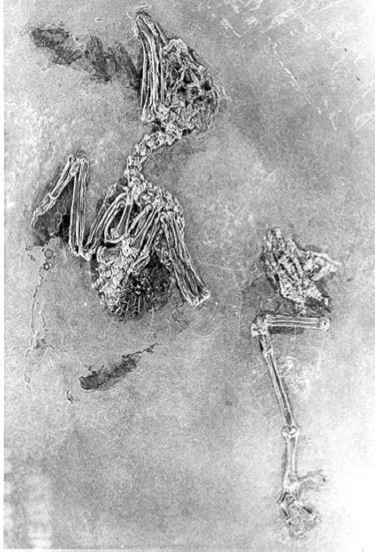 Cracraft, 1988) the herons were associated with a clade containing shore-birds and pigeons, although morphological (Livezey and Zusi, 2001) and molecular (Van Tuinen et al., 2001) evidence confirms the traditional grouping. The Charadriiformes (shorebirds, gulls and auks) may have arisen in the uppermost Cretaceous of North America (Hope, 2002), although more diagnostic remains are known from the Eocene of Europe and Africa. Most charadriforms have long legs and they seek food by wading in shallow water. The gulls are highly successful diving hunters, whereas the auks are wing-propelled divers, rather like penguins. Unusual fossil relatives may be the phorusrhacids (see Box 9.5). 2002), are based on fragmentary remains of the limb bones, which indicate birds ranging in size from oyster-catchers to swans or flamingos. The material is inadequate to decide whether all these birds belong to a single extinct family, or to a number of lineages, but they indi cate a diverse avifauna consisting of six species of possible charadriiforms, a tantalizing insight into latest Cretaceous bird evolution. The Phoenicopteriformes (flamingos) and Podicepidiformes (grebes) are both small orders and they may be related (Cracraft et al., in press), although other analyses link the grebes with the loons. Flamingos are known first from the Eocene of Germany, and they are familiar water birds in tropical regions, often living and feeding in highly saline lake waters. Grebes are foot-propelled diving birds. The oldest grebe fossil is Miocene in age. An oddity among these water birds is the Falconi-formes (falcons, eagles and vultures),but current analyses (Livezey and Zusi, 2001; Cracraft et al., in press) confirm this position. The oldest falcons are Eocene in age, and the New World vultures, the Cathartidae, also arose in Europe, with the oldest forms coming from the latest Eocene of France, and then crossing to the Americas in the Oligocene or Miocene. The New World vultures were traditionally included in the Ciconi-iformes and they were said to have evolved in parallel with the Old World vultures. Morphological and molecular data, however, indicate that both groups of 'vultures' are actually close relatives. The New World vultures include the largest living flying bird, the condor, with a wingspan of 3 m, as well as the largest flying birds of all time, the teratorns. The teratorns arose in the Upper Miocene of South America, represented there by Argentavus, but they are best known from the Pleistocene of North America. Hundreds of specimens of Teratornis (Figure 9.12(e)) have been found in the La Brea tar pits of California. Predatory birds such as Teratornis and a dozen species of hawks and eagles were attracted to feed, some becoming trapped as well. 80 kg), or by picking it up and dropping it from some height above the ground. Three marine orders complete the aquatic bird clade: the Procellariformes (albatrosses and petrels), the Gaviiformes (divers and loons) and the Sphenisci-formes (penguins). The Procellariiformes includes some very large birds, with wingspans up to 3.5 m. Fossils are known from the Eocene, and the group is better represented from the Oligocene onwards. Albatrosses arose in the Late Miocene. The Gaviiformes are foot-propelled diving birds, superficially similar to Hesperornis,with which they are not closely related, but still with the power of flight. Divers have a long fossil record, extending back perhaps into the latest Cretaceous (Polarornis, see p. 275). The Sphenisciformes (penguins) have a rich fossil record with 25 genera dating back to the Eocene (Simpson, 1975). They have completely lost the power of flight,but retain a deep keel and wings (Figure 9.13(a)), which are used for 'flight' underwater. 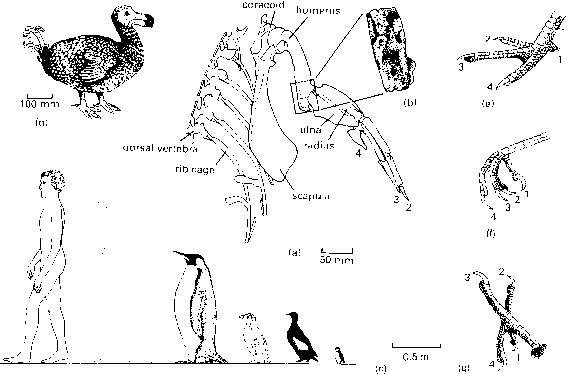 The diverse fossil penguins of the Oligocene and Miocene of New Zealand and Seymour Island, Antarctica, ranged in height from 0.3 to 1.5 m, but most are represented only by partial remains (Figure 9.13(b,c)). Seven neognath orders cannot be assigned to clades and remain unresolved in the cladogram (see Box 9.4), despite strenuous efforts to find their places. The Strigi-formes (owls) are known from the Palaeocene onwards. The Apodiformes (hummingbirds and swifts) and Caprimulgiformes (nightjars and goatsuckers) may be sister groups. They date back to the Eocene and the clade may have originated in Europe. The hummingbirds, which feed on insects or nectar and include the smallest living birds (63 mm long), are known as fossils only from the Pleistocene and Holocene. The nightjars and goatsuckers are nocturnal insect-eaters that have large gaping mouths in which they engulf their prey. The Musophagiformes (turacos) are a small order of 23 species known today from Africa south of the Sahara, but with fossils from the Palaeocene of Europe and the Oligocene of Egypt (Unwin, 1993). The Columbiformes (pigeons and doves) date back to the late Eocene/early Oligocene of the famous Phosphorites de Quercy, a French deposit that has yielded many bird fossils. One of the most famous extinct pigeons is the dodo (Figure 9.13(d)), a hefty flightless pigeon that was formerly abundant on the island of Mauritius. Sailors in the sixteenth century first discovered the tameness of these birds and they overcame their initial distaste for the 'hard and greasie' flesh. Specimens of this 'strange fowle' were exhibited in London in 1638 and a stuffed one was preserved in the Oxford University Museum. The last survivor was reported in 1681 and the Oxford specimen became so foul-smelling that it was burned in 1755. 2002). The Cuculiformes (cuckoos) are first reported from the early Eocene ofEngland. The most significant order of birds, the Passeriformes (songbirds or perching birds), has nearly always been placed at the crown of the neognath tree. But there has been continual debate about their closest relatives. Current analyses (Livezey and Zusi, 2001; Cracraft et al., in press) confirm the traditional view that the woodpeckers and kingfishers may be closest, forming part of a crown clade of six orders (see Box 9.4). The Piciformes (woodpeckers and toucans) date back to the Miocene of Europe and North America, but with early tentative records, Primobucco and Neanis from the early Eocene of North America. The Coliiformes (mousebirds), a small order of only six species of subsaharan African birds, traces its origins back to the Eocene of Europe and North America (Mayr, 2001). The Trogoniformes (trogons) and Bucerotiformes (hoopoes and hornbills) both date back to the late Eocene of France. The Coraciiformes (bee-eaters, rollers and kingfishers) have been reported first from the early Eocene ofEngland. The Passeriformes consist today of 5700 species of songbirds such as robins, thrushes, sparrows, crows, as well as flycatchers and antbirds, representing 60% of all living bird species. Several families of passeriforms are known from the upper Oligocene and Lower Miocene of Europe, and fossils belonging to an ever-increasing array of families have come to light from the Mid- and Late Miocene and the Pliocene. The fossil record of passeriform diversification is sparse, but not hopeless: 36 of the present 50 families have been recorded from the Pleistocene, and 17 from the Pliocene or Late Miocene (Unwin, 1993). the basal passerine group is the New Zealand wrens, Acanthositta. In addition, the traditional division of passeriforms into corvids (crows and relatives) originating in the Australo-Papuan region and passerids (all other songbirds) originating in the Afro-Eurasian region is incorrect: corvids are a subgroup of passerids. This means that the two basal branches of Passeri-formes trace their origins to New Zealand on the one hand, and to New Guinea/Australia on the other. Limited southern hemisphere fossil sites mean that the early Tertiary history of Passeriformes is unknown until various lineages penetrated the northern hemisphere in the Oligocene and Miocene. The woodpeckers and songbirds are perching birds in which the foot is specialized for grasping branches. In most birds there are three toes in front (numbers 2-4) and a small one (1) behind (Figure 9.13(e)).This posterior toe is enlarged in passerines in order to help them grasp small branches (Figure 9.13(f)). Some perching forms, such as the woodpeckers, also have the outer toe (4) pointing backwards as well to improve their grip, the zygodactylous condition (Figure 9.13(g)).